Previously restricted to the Google Pixel 3 and Pixel 2, the Moto G7 family are now set to get the company's innovative call screening feature in the latest update. Call screening from Google allows you to spot an unknown number and put them through to speak with Google Assistant to work out who they are and why they're calling. A transcript will appear on the screen as the person speaks to them so you can work out whether it's someone you want to speak to or not. If you do, you can then pick up the phone or you can send a message saying you'll call them back. This is designed to work out whether you're getting a spam phone call from a robot or a salesperson you don't want to speak to. You'll have to press a button to start screen calling when you're getting a call. At the moment, the feature will be restricted to those in the US. There's currently no release date for call screening for those in the UK or Australia, but we hope to hear more from Google soon. 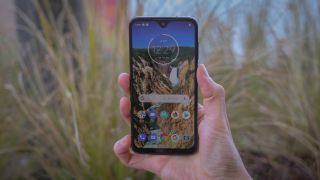 The feature is coming in the latest Android update for the Moto G7, Moto G7 Plus, Moto G7 Power, Moto G7 Play and the Motorola One. We expect the feature to come to other Android handsets in time, including the rest of the Motorola range. Motorola's software is very close to Google's own though, so it's likely this is the reason we are seeing the feature debut on these devices. When we'll see it on flagship devices, such as the Moto Z3, has yet to be revealed. Other features coming with the latest Motorola update include the Digital Wellbeing features that Google launched last year so you can keep an eye on how much you use your phone and how you use it. You'll also get new Moto actions such as flipping your phone facedown to active do not disturb or picking up your phone when a call is coming through to silence it.